We have so many favorite wedding venues in Chicago, but we thought it would be helpful to put together a list of our top 5. Let the party planning begin! All events below Planned and Designed by Bliss Weddings & Events. If you are looking for an incredibly flexible space that will host up 400 guests comfortably, has room for ceremony, cocktails, dinner and afterparty in separate spaces, that is super urban and polished, open until 2am (for your rockin after party crowd!) you've found a great option. Whether you envision a elegant ceremony with hundreds of guests, or an intimate reception with your closest family and friends, or a casual, dance party celebration, Morgan Manufacturing offers impeccable service and the most exceptional backdrop for your unique vision. Morgan Manufacturing offers over 32,000 square feet of world-class space with Chicago swagger, designed around a concept of modularity and industrial elegance. Say "I Do," in a romantic ceremony in the Distillery. The Distillery space features soaring ceiling heights, exposed concrete, glass, and steel to create the industrial elegance Morgan is known for. 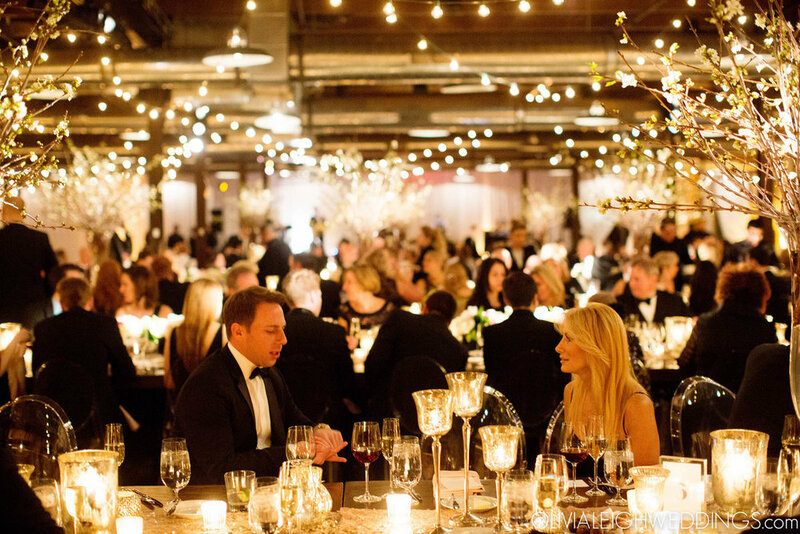 Then, dine and dance the night away in the expansive Production space. The iconic Field Museum is not only a stunning choice for a wedding reception, but It is also a huge showstopper, in a perfect location and incredibly flexible. Host an unforgettable evening in one of their beautiful event spaces where guests can explore exhibitions and dine among elephants and dinosaurs. Ceremony outside on their gorgeous grass lawn with the most incredible view of the city. Cocktails outside on their patio or inside if weather doesn't cooperate. Dining and Dancing inside the historic Stanley Field Hall, 2 levels of reception and dining space as well as access to SUE, our world famous T. rex. And the Afterparty in the architecturally elegant and sky-lit East Atrium Pavilion until 2am! 19 East is located at 19 East 21st Street in Chicago’s South Loop neighborhood. This venue is entirely managed by Food for Thought, special events and catering company that has been providing the best memorable experiences and hosting the finest special events in the city of Chicago for more than 30 years. This incredible, eclectic venue provides 10,000 square feet of event space that is completely flexible to your needs. 19 East’s four different rooms offer hardwood floors, steel beams, mosaic tile, built-in marble bars and high ceilings throughout- it is a sight to see. Housed in the former Spiegel Catalog warehouse, the Bridgeport Art Center’s “Skyline Loft” and "Sculpture Garden" defines raw urban elegance. The architectural elements from this historic 1911 building include timber construction, exposed brick, soaring ceilings, an amazing elevator that holds 50 guests at a time, sit-down dining and dancing for up to 500 guests and an unparalleled view of the Chicago skyline. Whether planning an intimate gathering for close friends and family or an extravagant gala, the open loft space on the top floor of the Bridgeport Art Center is a blank canvas that we ADORE transforming for any occasion that demands an exceptional setting. The Chicago Botanic Garden, with event sites nestled amid enchanting gardens, peaceful lakes and native woodlands, is a spectacular site for a special event. It is truly a dream land of opportunities in which we love to transform and enhance. At the Chicago Botanic Garden, your event springs to life amid a backdrop of pure beauty and serenity. This world-renowned cultural destination is the perfect venue for your wedding, reception, and rehearsal dinner. From the simple to the sublime, they have something for every taste! We had the true pleasure of working with the most amazing couple and family on a lovely wedding at the Chicago Field Museum. The bride loved preppy and glam, so we created a chic and sophisticated evening with the colors coral, poppy, navy and gold! We carpeted Stanley Field Hall with lush Navy carpet to soften and define the space. Guests were greeted with pedicabs to carry them into cocktail hour on the terrace. The after party in the East Atrium included a dueling piano bar, whiskey and pizza cart, cigar lounge and custom beer pong. We have been dying to share this winter wedding! Bliss and the beautiful couple created a warm and romantic setting in the midst of a cold Chicago winter. 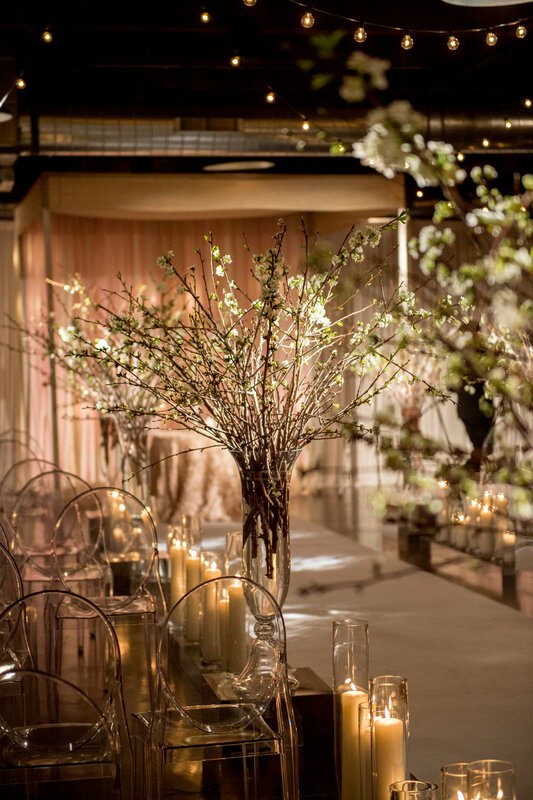 The glowing candles, floral branches, gold sequins, and blush tones mixed together for one dreamy tablescape! A memorable day was capped off with a surprise visit- the Doughnut Vault van pulled right into Morgan Manufacturing to serve guests late-night snacks. How fun is that?! See the full feature in Bride’s magazine!